Someone asked on a Facebook post about what to get a friend whose baby is in the NICU and as my response grew, I realized I should do a blog post on this. Stays in the NICU are a bit surreal. Life revolves around visiting hours, hospital hallways, smelly cafeterias, pumping, beeping machines, and lots of conflicting advice from professionals (which is a whole ‘nuther post). And a beloved baby. There are some specific items you can give a friend who is dealing with a NICU stay that will help and bless, varying in cost, but all useful. A really good water bottle. I don’t just mean any ole bottle, but one that can keep ice for long periods (so she doesn’t have to keep asking the nurses) or hot drinks hot. If it’s opaque, she can sneak in something other than water. Bottles of water are usually the only drink allowed bedside. Paul bought me this Hydro Flask on day six of our NICU stay and it was worth every penny. It has a nice wide mouth and is vacuum insulated. 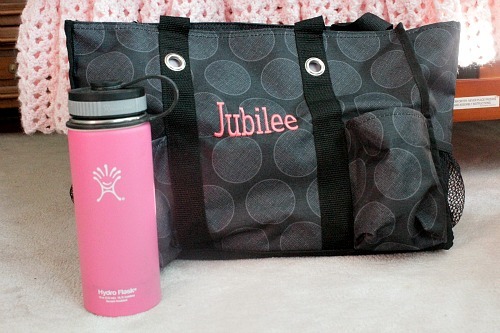 A pocketed and easy to carry tote. A friend gifted me a Thirty-One Organizing Tote and it was absolutely perfect for the NICU. I could fit my water bottle, keys, phone, binkies for Jubilee, pumped breastmilk bottles, and more in the side pockets. Inside, I could place my slippers, a hoodie, snacks, my wallet, and a blanket. Personalized is even more fun. A gift card to Starbucks or her favorite cuppa place. Driving in every morning is emotionally difficult and a little treat to start the day is a delight. The cups add up if she has to pay for it or she will just forgo treats. This little gift will go a long way. Seriously. Quiet to open snacks. Snacks aren’t usually allowed bedside and so that means the mama has to go out to the waiting area to eat a little snack. This means she has to leave her baby, turn in her hospital gown, walk two hundred yards or so, possibly get exposed to sick people, and then scrub up again and get a new gown just to have a tiny snack. Buuuuut if she has a little snack that she can open and eat quickly while the nurses aren’t looking, she can subdue hunger and stay with her baby. I used ziploc bags for cashew clusters and oatmeal bars. A cute zippered hoodie big enough for Kangaroo care. I wanted to hold Jubilee as much as possible for the bonding and all the amazing benefits. Sometimes, I would wear just a bra under a hoodie so that I could place her on me and then zip her up. It was wonderful. A friend loaned me one since mine were all too small to fit a little bundle in and it was a great gift. A gift card to the best place to eat in the hospital. UNMH was fantastic in that breastfeeding mamas could get vouchers for meals. I love that they want to support breastfeeding in that way. Truly. Still… the cafeteria at UNM had either a salad bar or the hot Ben E Keith packaged food meals available for the vouchers. Yes, there were lots of healthy foods, but they weren’t on the voucher option. And a salad bar has to be really impressive to be eaten for every meal every day. Know what I mean? So, a gift card or credit at the cafeteria or one of the restaurants in the hospital can open up the options for the mama. A dinner out. While lunch out would be nice too, I didn’t want to leave the hospital or Jubilee’s side unless I had to do so. Most NICUs close, yes, even to mamas, during shift change. UNMH was closed 6:30-8:00 am and pm. So, I had to go do something during those hours. I was blessed like crazy by people who took me out to dinner. Not only did this help me finacially, but it was fantastic emotional help. Visiting. Laughing. Talking. All help a mama lots. 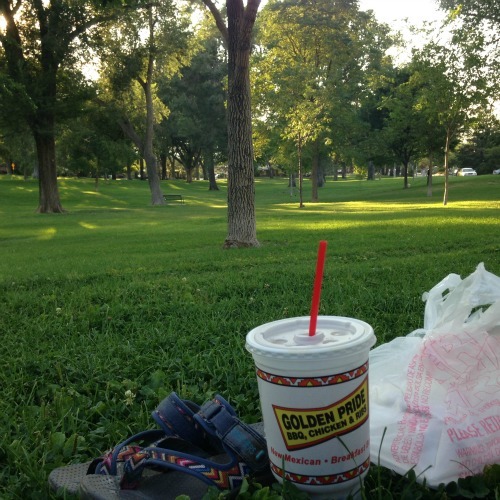 If it’s someplace with fresh air and a relaxing atmosphere, bonus points! A journal. 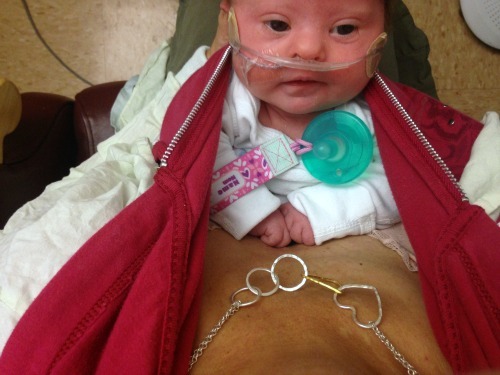 I have been amazed at how much I have forgotten about our time in the NICU. Details I wish I had written down for keepsake value as well as for reference later. I can’t remember the names of the doctors and nurses I wish I could recall. I can see their faces clearly, but not their names. A NICU mama could also benefit from jotting down the details of each day’s doctor comments, intake, questions, etc. Lastly, someplace for her to record her thoughts may be just what she needs to help with stress. A binder for all the medical information. If the beloved baby may have long term issues or concerns, then a binder with tabs could really bless the mama who needs to organize and be able to retrieve medical information. I was blessed to have a parent advocate mama come meet with me and give me such a binder with lots of great printables and such. I can’t believe how much it has helped since we left the hospital. Great gift. A box of thank you notes. If the NICU mama’s community is stepping in to help like they usually do and should, then she will have people to thank. While I do not think it’s expected for a NICU mama to write a note for everything done for her or her family (goodness, surely there is a break for her in the etiquette rule book), it’s nice to send notes when possible. I wrote mine in the NICU and brought them home for Paul to mail. 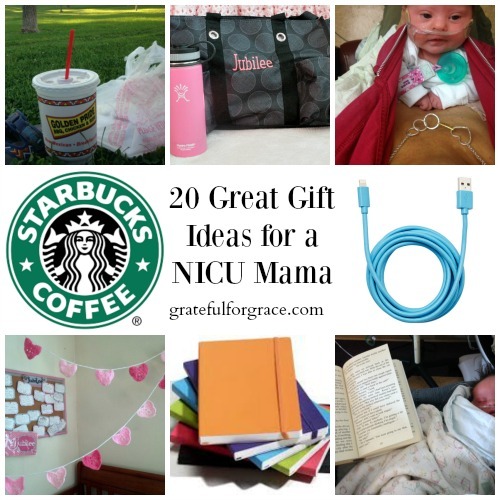 Read the rest of my NICU Mama Gift List, Part 2! Anything on here that surprises you?